It is also possible to create references to constructors. This is the general form of the syntax that you will use : className::new. This reference can be assigned to any functional interface reference that defines a method compatible with the constructor. For example, in the following program, the MyMethod( ) method of MyInterface returns a reference of type MyClass and has an int parameter. Next, notice that MyClass define a constructor, that specifies a parameter of type int. The line : MyInterface myi = MyClass::new; creates a constructor reference to a MyClass constructor. 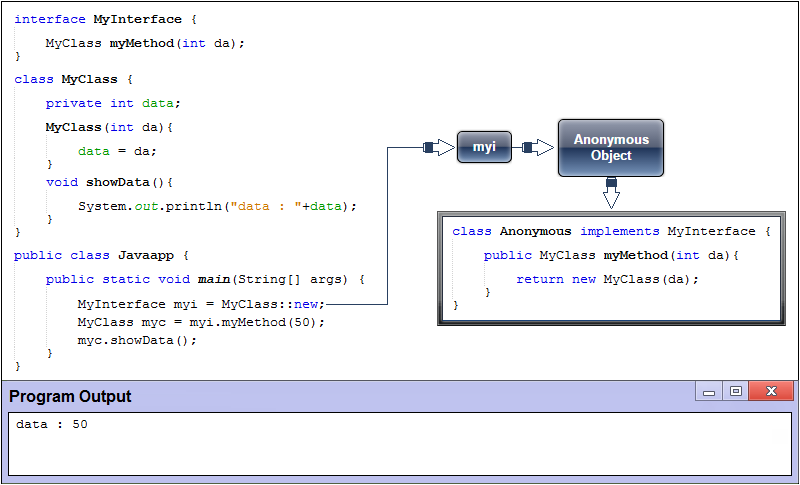 Because MyInterface’s MyMethod( ) method takes an int parameter, the constructor being referred to is MyClass(int da). Also notice that the reference to this constructor is assigned to a MyInterface reference called myi. After this statement executes, myi can be used to create an instance of MyClass, as the line MyClass myc = myi.MyMethod(50);. myi has become another way to call MyClass(int da).